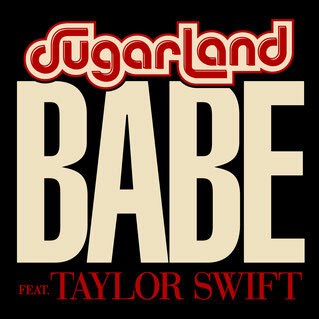 "Babe" is a song recorded by American country music duo Sugarland, featuring guest vocals from Taylor. It was originally written by Taylor and Patrick Monahan of Train for her 2012 album "RED". The song was released by Big Machine Records on April 20, 2018, as the second single from Sugarland's sixth studio album, "Bigger" (2018). The album's track list, which was released on April 12, 2018, shows that "Babe" is the only song on the album not co-written by Kristian Bush and Jennifer Nettles of Sugarland. It also marks the second song Taylor has written for a country act since making her full transition to pop in 2014 (following Little Big Town's "Better Man") and the first country song on which she is credited as an artist since that time. Sugarland told reporters backstage at the 53rd Academy of Country Music Awards that the collaboration came about after Taylor, who is a Sugarland fan, called the duo wanting to work with them. "She was gracious enough to reach out to us when she heard we were coming back together and doing a record," Bush said. "She said, 'I have a song, would you like to do it?' And we said, 'Uh, yeah!' I was a little anxious. I didn't want to mess it up!" Nettles added: "But she loved it and wanted [us] to be a part of it, which is exciting. She said, 'I have a song,' and we said, 'Okay. Send it over.'" The duo found it to be an unusual arrangement, since they have never featured anybody on their past albums. "So we weren't really used to sorting through that and we didn't want to mess it up. We didn't tell anybody about it until we got finished and she liked it, thank God." Taylor had the original idea for the video's concept, and as stated per the Sugarland duo themselves, they all got together before the video shoot to collaborate on ideas. The video, directed by Anthony Mandler, features Brandon Routh, Jennifer Nettles and Taylor in primary roles. Routh and Nettles are a married couple while Taylor plays the role of a secretary who is having an affair with her married boss (Routh). Routh is shown to be an unfaithful husband throughout the clip and is, ultimately, discovered by Nettles. However, it is later revealed that both women were victims, with Nettles being cheated on and Taylor being told by Routh that he loves her and has written love letters to her, but later abandons her, breaking both women's hearts. The video ends with Routh leaving Taylor's house to find his front doors locked and his belongings thrown out on the lawn. Nettles, now alone and free, lies down to go to bed, ready to enjoy her new life, and Routh leaves, as Kristian Bush, playing their neighbor, witnesses the whole thing while walking his dog. Taylor 's attire in the music video was compared to that of character Joan Holloway from the television series "Mad Men". The music video was nominated for "Video of the Year" at the 2018 CMA Awards and 2019 ACM Awards.